Look back... or not?! Some hold the viewpoint of not looking back. There is the analogy of the size of the car’s rearview mirror in comparison to the front windshield. Some quotes read “do not look back, that’s not where you are going.” How then do we measure progress if we can’t look back to see areas where we can do things differently? For me, this is how I see it; not looking back with regrets but to see how far I’ve come and lessons learned while looking forward with hope for better things to come. Which viewpoint do you hold and why? Think back to the time when you embarked on something new. I bet there was a lot of back and forth, some what-ifs, self-doubt, speed-bumps, potholes, long duration red lights, flashing red or yellow lights, challenges, not getting the feedback you were expecting from those you shared your ideas with...etc. 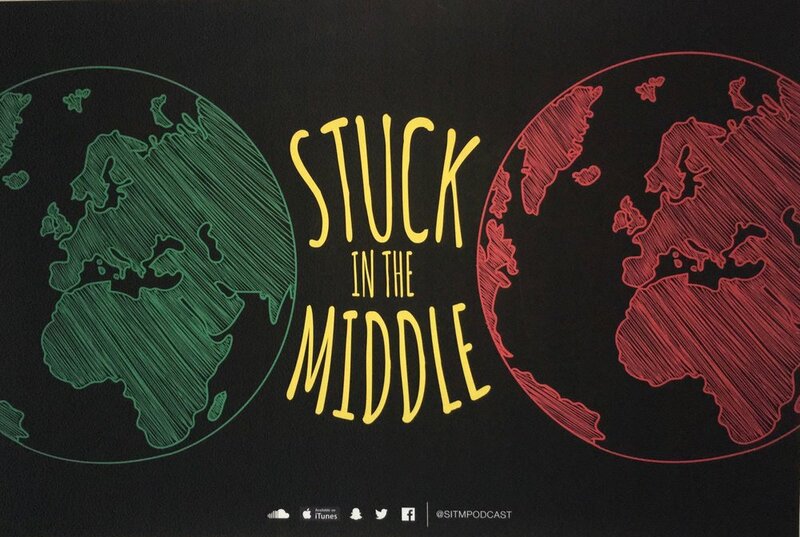 That’s the story behind how the Stuck in The Middle Podcast (SitMpod) came about. The first interview took place on Sunday, February 5th, 2017; one year down 50+ episodes up! Here with a review of some of the interviews through December 2017 in no particular order and one thing I learned from them. I had a hard time narrowing it down to keep from writing a book! This will exclude interviews I’ve previously blogged about. Best believe I did learn something from all interviews. Somethings were reinforced or reiterated, some caused me to literally have conversations with myself. The first guest was DJ Barack who mentioned being inspired by Barack Obama running and becoming president. I would want to believe that many others have been inspired in one way or another to take a leap of faith by Barack Obama becoming president. This got me to reflect on who inspires me. How about you? Who inspires you, how and why? An interview which got me talking to myself was the one with Jason Nkwain. He turned down a potential job offer at NASA to be an educator with a pay difference of about $19,000 less…. WHAT???!!! Given the society we live in, the demands, bills and school loans, that was a … choice. I’m not sure what word to use to describe the choice he made; brave? Sharing his experience as an educator with so much passion reminded me of why/how I ended up in a non-traditional profession. Something he mentioned that I can relate to is “I get more out of it than I bring to it.” Not financially! There is a sense of coming alive when you see the impact you make in other people’s lives and the effect it has on you, including the challenges and self-growth that no amount of money can compensate for it. What are you passionate about and why? Are you involved in your passion? If not, find a way to get involved. You could volunteer, it doesn’t necessarily have to be your job. What am I passionate about? Primarily health and education (formal/informal) and I have a deep respect for those involved in improving Africa in those aspects. I was honored when asked to join the board members of the Hope for Children Cameroon Organization back in 2015 by the Co-founder; Joannes Paulus Yimbesalu aka Pater Noster who has been a guest on the pod. Two other guests who inspired me were; Langmia Fonjoe cofounder of One ROC (Readiness Open-mindedness Cooperativeness) Foundation and Fotemah Mba of JUMP (Join Us Making Progress) Africa. What inspired me about Langmia Fonjoe was to see that at his age (early 20s), he and his brother founded an organization aimed at reducing with the hope of eradicating school dropout in Bali (Northwest-Cameroon). With Fotemah Mba; the story of the girl who was crying hysterically over a missing pen, something we have here in abundance and take for granted. He encourages us to become the change we want to see and improve our Africa rather than blame the government which no doubt isn’t helping the situation but isn’t preventing us from making a change. The beauty about my career field is that I can work in different settings with different age groups. During my one-year experience in a school system while in graduate school, I developed a deep appreciation for educators who are passionate about what they do; especially in the area of special education. Such was the interview with the CEO and founder of The Center for Information Technology (Infotech) Sans Frontier and the Chair of the Biggs and Littles Program. They organize an annual STEAMM (Science, Technology, Engineering, Agriculture, Arts, Music, and Math) Fair with the aim to provide technology readiness, bridge the gap, provide resources and mentorship for the children in our community to be productive members of society. This could help bring out the next innovation by our kids who may be sitting on the couch watching SpongeBob. Be on the lookout for the STEAMM fair this year and sign-up your children; K through 12th grade, to attend this free event. In health; as a healthcare professional in a Subacute setting, I’m constantly bombarded with varying medical conditions. My heart goes out to those braving through challenging medical conditions and using their experience to empower and provide resources for others going through same challenges. Geraldine Aloh shared her story on living with Sickle Cell Anemia. Still, along the lines of health, the topic of Mental Health and HIV/AIDS is one that isn’t discussed enough in our community. When listening to the discussion on HIV/AIDs via my phone, that Carfax commercial came on the radio. So I said to myself, how about a commercial that says “show me the CD4 count! Ha! May we know our numbers… Blood pressure and all so we can do better. IHeartHealthExpo will be having a free event Saturday, February 24th. Come out and get free information and free screenings! What makes your heart leap for joy? For me, it would be nature and art in every form; paintings/drawing, photography, books, plays/drama, choreography, music...etc. Listening to the interview with Ganza who is from Rwanda was like a therapy session for me. Up until his interview, I had not come across someone who is involved in multiple areas of art. One thing he said that stood out to me was how beneficial meditating for two hours and waking up at four AM has been beneficial. I thought to myself, “An African, meditating for two hours?! What?! And I’m here struggling with 10mins?! This gave me hope to keep trying for my goal of 30 minutes. Let’s talk about energy/vibe. What determines how long I stay in an environment is the energy/vibe. Two guests whom I felt lit up the airwaves with their vibe were Aida Gueye and Tzy Panchak. Tzy with that contagious, authentic smile and warm personality. Oh, his voice and music! Let's not even go there… Aida Gueye; a model originally from Senegal. It was interesting to hear her say she stays away from sexualized projects, recognizing reality versus perception especially in this time of social media. She discussed setting standards in personal and professional life, staying true to herself and her spiritual journey... Oh, how I connected! When she mentioned playing basketball as her first love, it reminded me of my lawn tennis days. The Essentialist! The name got me curious about who it was and what they do. Turned out he is into photography and style; Art again! He defined an “essentialist” as someone who does more with less. He believes in putting all his talent to work and challenging them. He credits his current level of achievement to being rejected multiple times which fueled his drive/passion. One thing that stood out to me is his comment on the negative representation of African men in our society and his journey to changing that perception by being a living example of a positive representation. In business, Chiko Abengowe founder of Perfect Staffing and Perfect Office Solution LLC shared his story which initially sounded like a fairy tale. He quit his job at the age of 26, got into business having less than a thousand dollars to his name and one to three years later he was counting hundreds of thousands of dollars. He described success in terms of how he can help others succeed. He will be having an event on Saturday, March 24th, 2018 on How to Start a Million Dollars Business. Register here! In technology and digital marketing, Sterling McKinley mentioned being big on the power of asking rather than waiting for things to “fall on you” (what song comes to mind?). He discussed how to use social media to your advantage in promoting and growing your business. He mentioned the get found formula and other strategies that made me stop for a few seconds and go oh really?!. In a nutshell, in most, if not all the interviews thus far, passion appears to fuel what we do and why we do it.